From the Big Apple to the Big Bear: I watched the VP debate. Can this be for real? Can anyone actually have watched this debate and not be disgusted? I saw this before watching the debate and it is actually quite realistic. How can anyone contemplate having Sarah Palin a heartbeat (and that an elderly, cancer survivor's heart beat) away from the Presidency? BEATS ME!! and yes, I meant to shout! Well - since I am not American and won't be voting (did I mention it is compulsory to vote in Australia?) then that chart is scary... but there is another side of me that really wants her to do well - she and I are the same age... both well educated, mothers and married. If she is cut off at the knees and thought to be stupid.. then where does that leave me? Because it is all about me??? LOL )(sorry... got carried away) -- I get your fear... but I think she might do well in the future? Have you posted your thoughts on Hilary? Please- she and I are also the same age. But I don't believe that humans rode dinosaurs, that all religious groups other than mine will burn in hell (as does the church she was raised in and belonged to until a few years ago), that abortion (which I call "choice") should not be available to girls raped by their dads, and that abstinence as the only method of birth control, and the only method taught, makes sense. That even with an example showing her that's not true and with every medical group saying the same thing with studies proving it. She's a pretty whack job and I can't be bought off because she has ovaries. What should I say about Clinton? I voted for her. I think that not only would I have liked a female President, but that Obama is incorrect in believing that national Health Care can be effective when not mandatory, because young, health people will opt out (the principle of adverse selection). However, his plank is so close to Clinton's that I can live with it. I also think it will become clear that health care must be universal. Where do I go with McCain? I preferred him to Bush 8 years ago, but he has changed and I can't accept his views. I respect his heroism, and he is a hero. But that does not earn him the right to be president His concept of tax cuts for those making over $250,000 while having huge increases (by, for example, taxing employer provide health care) shows how out of touch he is with everyone I know. It amazes me that people don't actually understand his policies.People actually think they will be better off under him. Well, if they are fabulously wealthy (as he is) they will be. And note that Palin's down home family made over $170,000 and that with her husband on a leave of absence and taking 61,000 in deductions on his 66,000 fishing/racing recreational sports (since he left his 100,000+ BP job). 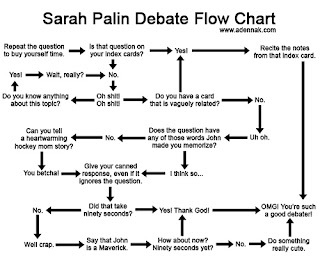 Sarah Palin is stupid. And she is small-minded and mean and just nasty, traits which were really evident in the town of 7500 that she governed. OK- I need to stop now. I am hyperventilating. I don't actually think she's stupid, she just hasn't been very curious about the world; so she's never bothered to learn anything more about it other than what she had to in order to get elected. I've had first-hand experience with her religious beliefs so I know they don't encourage questioning minds. Let's face it, she stands to become a millionaire if she and McCain manage to win (even if they have to cheat somehow like...uh ummm...others we've known who shall remain nameless), so I guess the risk of looking like a fool is worth it in the end...for her, not for me. I sure know what you mean about hyperventilating. Hearing her make those accusations today over and over about Obama having terrorist friends and not feeling the same about America as she does nearly made me have a stroke. Oops... take a breath! Some excellent points and I am still laughing at 'I can't be bought off because she has ovaries.' excellent point. So you feel that she was a big fish in a little pond? I haven't been able to track down just where she actually stated that humans rode dinosaurs... surely it was said in jest? And regardless as to the outcome of the election - she is going to make money, if only as a spokeswoman for Avon (hehehheeh) challenging debate in the blogging world - fantastic! I don't think she actually stated that humans rode on dinosaurs, but since she is a literal Creationist and the Creationist (Fantasy) Museum depicts that, I think that is a fair enough statement.